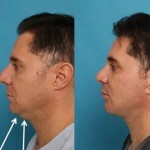 The neck lift and the aging neck – Los Angeles, California plastic surgeon Dr. John Gross says the neck is where we begin to see the first signs of aging. The neck is also one of the more difficult areas to conceal your age. When many people hit middle age they begin asking, “What happened to my neck, and how can I fix it?” says Gross. neck lift is listed at number five for the top procedures for men and number seven for the top procedures for women, according to the American Society of Aesthetic Plastic Surgery (ASAPS). If you’re seeing loose skin around the jawline and on your neck, you may be a candidate for a neck lift. Dr. John Gross says a simple way to understand what happens with the aging neck is much like a stretched out hammock. “We have a muscle in our neck that is a little bit like a hammock, it goes from ear to ear, across the lower jawline; it’s what supports our youthful neck,” explains Gross. According to the American Society of Aesthetic Plastic Surgery (ASAPS), banding, wrinkling and fullness of the neck are a few of the symptoms that can make your neck look old. Aging of the neck is usually a combination of sagging skin, loose muscle and some excess fat. Experts say that each case must be considered independently to determine what type of procedure will result in a younger-looking neck area. You’re so cool! I don’t believe I’ve truly read something like that before. So wonderful to discover someone with some original thoughts on this subject. Seriously.. thanks for starting this up. This web site is something that’s needed on the web, someone with a bit of originality!